Hayes, E. & Ohrnberger, M. (2013). The Gamer Generation Teaches School: The Gaming Practices and Attitudes towards Technology of Pre-Service Teachers. 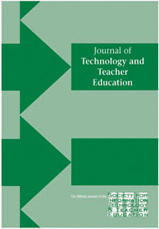 Journal of Technology and Teacher Education, 21 (2), 154-177. Waynesville, NC USA: Society for Information Technology & Teacher Education. Retrieved April 24, 2019 from https://www.learntechlib.org/primary/p/41242/.